(32" Chest) Vintage Boys 70s Disco Shirt! Somewhere Over the Rainbow on a Bicycle! 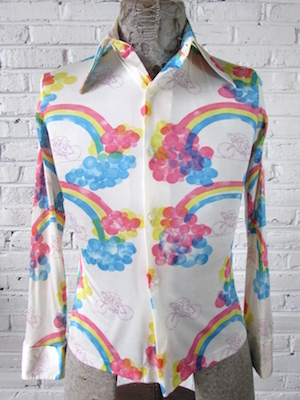 Home > Men's Vintage Shirts > All Men's Vintage Shirts > (32" Chest) Vintage Boys 70s Disco Shirt! Somewhere Over the Rainbow on a Bicycle! Kids vintage 1970s disco shirt. 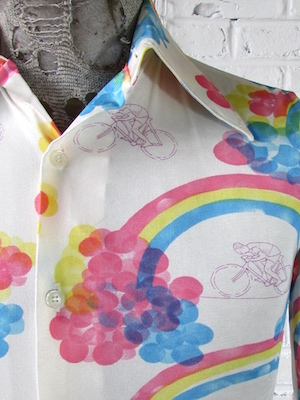 This super groovy disco shirt has a glossy white base with pink, yellow and blue rainbows with a pink line drawing of bicyclist riding beneath them! Has a super wide & pointy disco era collar. Closes in the front with pearly white buttons with one matching button on each cuff. Shirt has a straight hem. Made in the USA. Tagged by Hanging Vines. No material tag, but feels like polyester. Condition: Very Good. Has a faint brownish stain on the lower left side of the shirt. Does not detract from the awesomeness of this shirt!